Chutney, an Indian condiment is well known all over. And the South Indian Coconut Chutney needs no introduction. As I have mentioned earlier, we love Idlis and Dosas for breakfast. 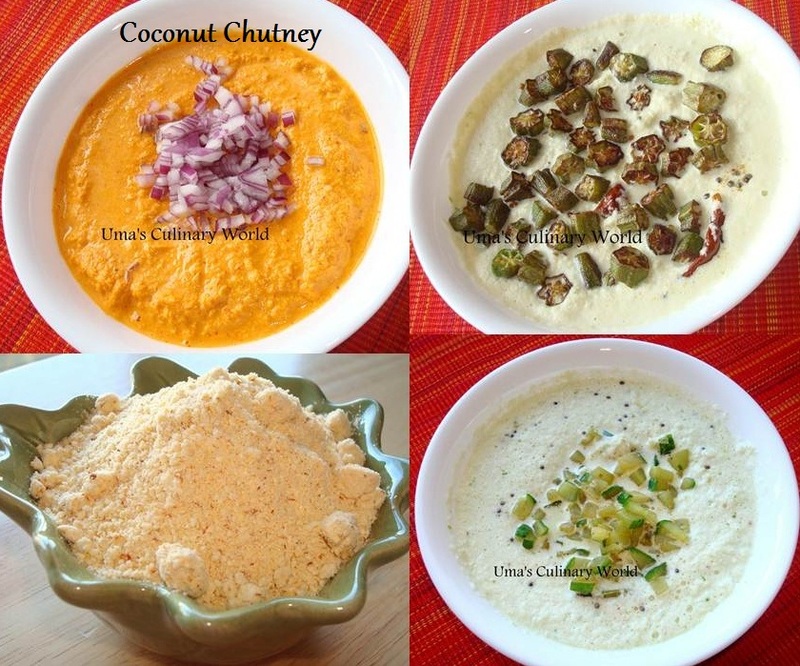 Just like the variety of idlis and dosas, my Mom used to make a variety of coconut chutneys. If you are looking for something new and different, try these Konkani variations of chutneys and make your everyday breakfast more tasty. Wash curry leaves and green chillies. Pat them dry. Make slits in the green chillies with a knife. Roast the green chillies with few drops of oil, until the skin gets slightly glazed. Grind grated coconut, split dalia, roasted green chillies, tamarind and salt to a fine or slightly coarse paste. Add water little at a time, for grinding the chutney. For tempering/tadka/phaNa, heat about 1 tsp oil. Add mustard seeds, dry red chillies, curry leaves and asafoetida. Turn off the heat when mustard seeds pop. Add ground coconut paste to it and your Coconut Chutney is ready. If you don't like this tempering, substitute the tempering with ginger and add it while grinding coconut. Serve Khobre Chutney with Idlis, Dosas or as a side dish with meals. These chutneys taste great with parathas and roti too. Kande Tamboli - Coconut Chutney with Red Chillies topped with raw onions. Bhenda Chutney - Coconut Chutney with Shallow fried Okra/Bhendi/Lady's finger. Tavshe Chutney - Coconut Chutney with Shallow fried Cucumbers/Tavshe/Kakdi. Phutane Chutney (Dry) - Dessicated (Dry) Coconut and Dalia/Phutane Chutney. Lasani Chutney (Dry) - Dessicated Coconut Chutney with a garlic/lahsun flavor. More commonly used for Vada Pav. If you are wondering what phutane is, here is a picture of Dalia or Roasted Chana Dal. We do this chutney almost everyday for our breakfast.